The rainforest is home to half the world’s animals. It is warm and wet all year round – the perfect conditions for life. All these creatures must eat to stay alive, and the thick forest hosts a deadly game of hide and seek, as predators hunt down other jungle animals. 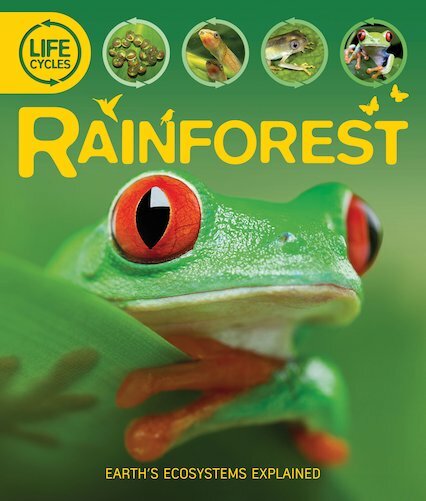 Venture into the lush greenery of our planet’s richest habitat in this captivating look at rainforest habitats and ecosystems, which uses clear text and punchy nature photography. Following the life cycles of ten animals and one plant – including a leafcutter ant, an armadillo and a jaguar – the book shows how each creature is born, grows, reproduces and dies. All of the life cycles link together to create three food chains, which ultimately interact to make a food web.